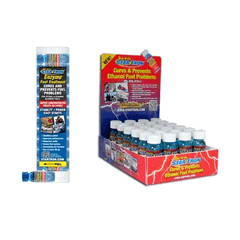 Star Tron Gasoline Formula makes engines start easily and run smoothly. It cures & prevents ethanol fuel problems such as water in fuel, or lost power. It also helps prevent phase separation, removes gums, varnish and carbon deposits and will stabilize gasoline for up to 2 years. It works in boats, cars, motorcycles, small equipment or any other 2 or 4-cycle engine.